Historically, in English and other European weddings, the bride was considered a cherished piece of property and “handed down” from the father to her new husband. 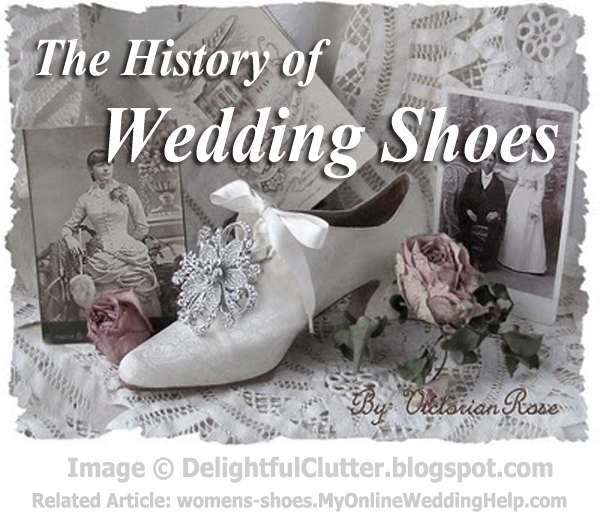 To signify this passage of ownership and responsibility, the father gave the groom one of the bride’s old shoes. Variations on the same tradition included the groom keeping his foot on her shoe during the entire ceremony or tapping her forehead with one of her shoes (Huh?! I can only imagine what many modern brides would do with that shoe). Most of us have abbreviated the old adage down to “something old, new, and blue,” but did you know the original included “a silver sixpence in her shoe.” A penny or sixpence, depending on the country, was placed in the bride’s left shoe to assure a happy and wealthy marriage. Nowdays, blue shoes sometimes signify the “something blue,” but otherwise wedding shoes are primarily about fashion. White shoes are still popular, of course, but wedding shoe choices have expanded to include different colors, platforms, wedges, and other styles. Explore our newly expanded and redesigned women’s shoes section for more options and ideas.